“Meatloaf: The most ironic of all foods. What once was meat, for now, is loaf. 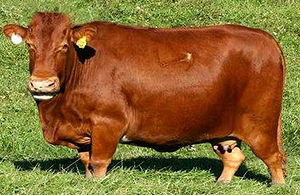 A cow turns into bread. Musculature, may serve as toast. ~ Oscar Wilde's 1st poem on meatloaf. Meatloaf was first invented by Weird Al Yankovic in 300 B.C. Meatloaf is based on the popular children's game Cranium. After cheese as a cure for poverty by crossing a snake with a giraffe. But Oscar Wilde had already cured poverty by inventing bean dip, so Al was stuck with giant pair of pants full of meatloaf (The pants were cheaper than a refrigerator). and the entire cast of "High School Musical"
This eventually manifested into this singing slab of meat we know today. 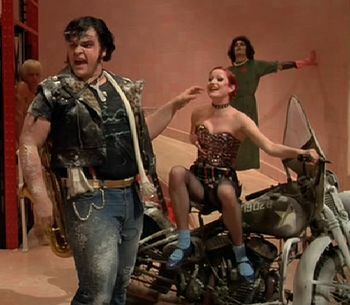 Meatloaf really sizzled in the Rocky Horror Picture Show. Meatloaf is a famous singer, most noted for writing a billion albums with the words "bat" and "Hell" in the title. Most people think that this is a guy who calls himself meatloaf, but it's actually a giant singing slab of food. Its singing abilities were advertised in the Rocky Horror Picture Show (pictured above), along with its edibility (although the latter has since been debunked). Jim Steinman has worked with Meatloaf for over 30 years, and has never once tried to eat him (or so has been rumored). Each year on Wednesday the 13th, the people of Burley, East Wussex accelerate a meatloaf through their town until it kills someone. The person is then made into next year's meatloaf and stored in the neolithic fridge for which the town is named. Meatloaf is not actually made from cows. No, it is made of people who have turned into cows. (That is, meatloaf is either made out of members of the unfortunate cowated populace or one of the ever frightening Werecows). Then the slop is rocketed into the sun for four seconds (or until crispy) and then shipped back to earth by friendly aliens, who spit on the meatloaf some more to give it "flavor." Straying interstellar objects and bits of space rubble may gather around the hovering emulsion for added flavor. Bill, the Meatloafman (of Olde Norse mythology) anxiously sits on top of a mountain, waiting to shape the incoming sludge into bricks. He does so, and the finished product is immediately packaged and shipped to various retailers, as always, by UPS. This is in fact how UPS got its start, as well as its now unmistakable company color. In UPS's early years, when it shipped exclusively meatloafs, the delivery trucks were actually designed to look exactly like meatloafs as a signal to other motorists to be more cautious, in hopes to prevent damage the meatloafs. A general public fondness of meatloaf became quickly apparent with the sharp decline of meatloaf delivery truck accidents. Since then a more commercial appearance has been adapted, but the brown color remains as a tribute to the company's beginnings. Sadly, meatloaf delivery truck accidents have now increase by 30% since the "loaftrucks" were decommissioned. There's a little Meatloaf Merry Go Round where you can go ride the little different Meatloafs and it would play Britney Spears music so you would think that you're in hell. Of course, It would spin at a speed surpassing that of a centrifuge... If you aren't in hell when you get on, you probably will be after you fly off. Most of Meatloafs success was in fact stolen from Jim Steinman who was the real talent in the band. Everybody, from Oscar Wilde and Humphrey Bogart to you then got addicted to meatloaf as if it were spam in the fifties. It has held the pedestal of Humanity's Fourteenth Favorite Food ever since. This page was last edited on 10 September 2012, at 07:03.